Karsten, Peter. "Zoos". The Canadian Encyclopedia, 07 July 2017, Historica Canada. https://www.thecanadianencyclopedia.ca/en/article/zoos. Accessed 24 April 2019. Zoos or zoological gardens are facilities exhibiting wild and domesticated animals for purposes of education, recreation, conservation and research. Zoological gardens can be conventional, dense-occupancy zoos to open animal parks and game farms. Giraffes at the Metro Toronto Zoo (photo by Barry Dursley/First Light). Zoos or zoological gardens are facilities exhibiting wild and domesticated animals for purposes of education, recreation, conservation and research. Zoological gardens can be conventional, dense-occupancy zoos to open animal parks and game farms. They can incorporate aquariums exhibiting fish and other aquatic life forms. Often, aquariums, oceanariums and sealife parks are independent, specialized, public facilities. People have always kept captive wildlife. Nomadic peoples maintained few species, but with the emergence of sedentary societies, animal collections became larger and more commonplace, eg, in Egypt, Assyria and China 3000-1000 BC, and later in Greece and Rome. Augustus Caesar (63 BC -14 AD) maintained a menagerie of over 3500 vertebrate animals, a collection larger than any Canadian zoo. The famous menagerie of the Aztec ruler Montezuma II (circa 1480-1520 AD) employed 600 keepers. When monarchies were replaced by parliamentary governments, many private collections became public zoos; eg, the menagerie of Louis XVI, at Versailles, was moved to the Jardin des Plantes (1794). Today's public zoological gardens have evolved in the last 200 years. The World Zoo Conservation Strategy (1993) estimates there are 1000 organized zoos housing some one billion wild animals and are visited by over 600 million people annually. The 1998 roster published by the Canadian Association of Zoological Parks and Aquariums (established 1975) notes 21 accredited institutional members and 3 associated members holding animal collections. Private zoos brought prestige and enjoyment to their owners and entertainment to their guests. Early public zoos emphasized recreation, later coming to serve modern objectives of education, conservation and research. During the first half of the 20th century, zoos commonly attempted to show a wide variety of species in rows of cages, giving animal inventories the character of stamp collections. The concentration of species offered a broad spectrum for taxonomic (systematic classification) study and, by its diversity, considerable entertainment to viewers, but the approach has become outdated, and zoos have been redesigned on foundations of a better understanding of animal psychology, behaviour and wildlife appreciation. Zoo education programs have shifted focus to enhance ecosystem, biodiversity and environmental awareness. Urban environments are in sharp contrast to undisturbed natural ecosystems, and zoological gardens serve as a link and catalyst to nature appreciation. The artificial environment of a zoo must accommodate the physical and psychological needs of animals; exhibits must provide seclusion, sight barriers, camouflage, opportunities for hierarchical positioning, and stimulus to prevent boredom and stereotyped behaviour. The reduction of obvious barriers (eg, bars, fences) is important. Many modern exhibits contain animals through their physical and behavioural limitations, using water moats, dry moats, electric fences, light zones, etc. Glass barriers are used to provide an unobstructed view. Many exhibits have off-exhibit facilities (eg, maternity dens, sleeping boxes, treatment enclosures) that are often equipped with closed-circuit television for behavioural monitoring. Zoos are engaged in various international conservation programs. International studbooks are maintained for over 150 endangered species. The American Zoo and Aquarium Association adopted a Species Survival Plan (1981) which has the committed support of participating zoos. Zoos have become wildlife producers, not wildlife users as in former times. Today, few animals are collected from the wild for zoos. Most zoos operate extensive rescue and animal orphanage programs. Rehabilitated specimens are returned to their native habitats or are exhibited and traded with other zoos. With diminishing wild habitats, countless species of animals become endangered, even extinct. Zoos propagate various species in captivity, and some species now depend on captive management for survival. Relatively few species can be perpetuated in captivity: only about 9% of known mammal species have had consistent multiple-generation reproductions in captivity. The Calgary Zoo and the Metro Toronto Zoo established ex situ breeding programs for whooping cranes (Calgary) and black-footed ferrets (Toronto) as an integral part of the Species Recovery Programs of the Canadian Wildlife Service of the US Department of the Interior. The zoos are propagating animals to protect the gene pool and enable in situ re-introduction. Objectives are now focused on general conservation, establishment of self-sustaining populations, specialized education programs and presentation of wildlife in natural habitat settings. Zoos have become complex operations. Animal husbandry, research and development, education and interpretation, veterinary medicine, public relations, fund development, food services, horticulture, facility maintenance, security, marketing, general administration and finance have important zoo components. Many zoos are subsidized by municipal or provincial funding; direct federal funding is less common. Other facilities operate commercially; shareholders receive profits after operating expenses and capital development costs are covered. Commonly, zoos have the support of zoological societies - volunteer, usually tax-exempt, nonprofit organizations; involvement ranges from interested affiliation to managing authority. Major zoos are found in larger cities. The Riverdale Zoo in Toronto (established 1887) was Canada's first. The Metro Toronto Zoo, Canada's largest, opened in 1974. Others include Stanley Park Zoo, Vancouver, 1888 (scheduled for closure); Assiniboine Park Zoo, Winnipeg, 1905; Calgary Zoo, 1917; Moose Jaw Wild Animal Park, 1929; Provincial Wildlife Park, Shubenacadie, NS, 1947; Vancouver Aquarium, 1956; Jardin Zoologique de Montréal, 1957; Valley Zoo, Edmonton, 1959; Aquarium de Québec, 1959; Aquarium de Montréal, 1967; African Lion Safari, Rockton, Ontario, 1969; Parc Safari Africain, Hemmingford, Québec, 1972; and Salmonier Nature Park, near Holyrood, Nfld, 1978. Canadian zoos range from very modest collections to facilities exhibiting more than 3000 animals of over 400 species (invertebrates excluded). Costly housing requirements during the winter season may limit the number of tropical species. 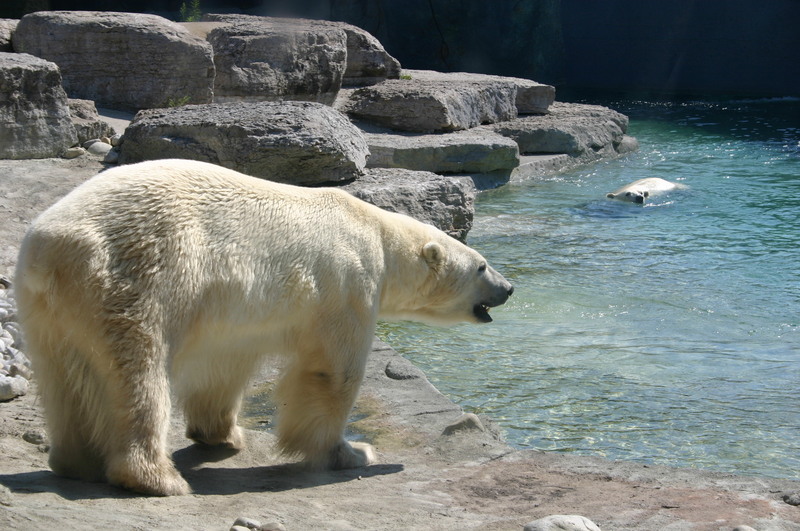 More than 15 million visitors are estimated to visit Canadian zoos annually. Metro Toronto Zoo Climb into this website to find out about the animals that make their home in the Metro Toronto Zoo. Also check out the latest news about their environmental conservation and educational programs.